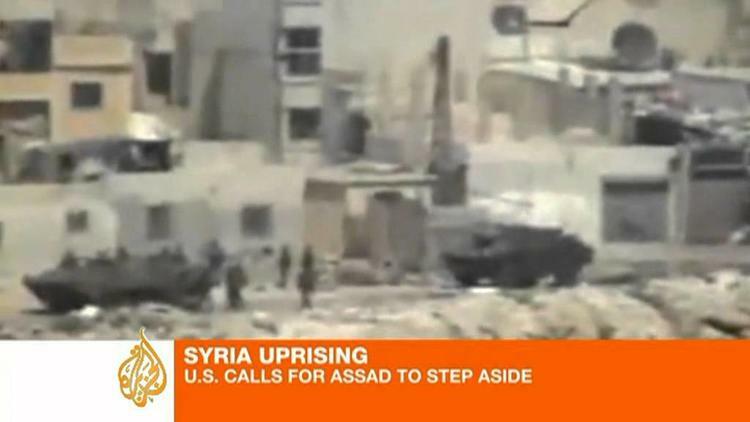 President Obama, along with the European Union, called on Thursday for Syrian President Bashar al-Asad to step down. At the same time, the US announced severe economic and financial sanctions against Syria, essentially cutting the Syrian banking system off from access to US banks, and forbidding American citizens and firms from doing business with the Syrian government. Plans are clearly being made to closely identify exactly which state-owned firms control Syria’s small petroleum industry, and to put those under sanctions. In short, the North Atlantic world took a big step toward making Syria a pariah state, rather like North Korea. What stands in the way of Syria becoming quite that isolated is continued support for Damascus from some Lebanese factions and from Iran, China and Russia. The strategy is to starve the regime of funds it needs to crack down on protesters, and to to help the reformists. The Baath regime in Syria has deployed snipers and tanks and other heavy weaponry against non-combatant protesters in many towns and cities. Human rights groups suggest that he has had over 2000 people killed for peaceably assembling. Unfortunately, sanctions are not a strategy that has been known to work very often, if at all. Baath Party officials will insulate themselves from the effects of the sanctions, and pass the pain on to the common people. One reason the administration gave for the time it took to come to this point was that Washington felt a joint declaration of the US and European allies was necessary if further sanctions were to bite deeply for the regime. It has taken this long to hammer out a US-EU consensus on the need to sanction Syria for its brutal repression of protesters. Presidential aspirant Michele Bachmann criticized Obama for not having imposed these sanctions weeks ago She says Obama is ‘leading from behind.’. But Bachmann is on record as opposing US participation in the NATO intervention in Libya. So who is leading from behind? And how would she know how long it takes to get the 28-member European Union on board with a new sanctions policy? Joshua Landis analyzes the meaning of the constitutional changes allowing greater political pluralism, instituted by the Baath Party. He is skeptical about this step providing a soft landing for al-Asad, who is likely to cling to power as long as he can. On Thursday night, troops of the regime fired on protesters in Homs, killing one man and wounding another. Aljazeera English also reports on the persistence of the protests.